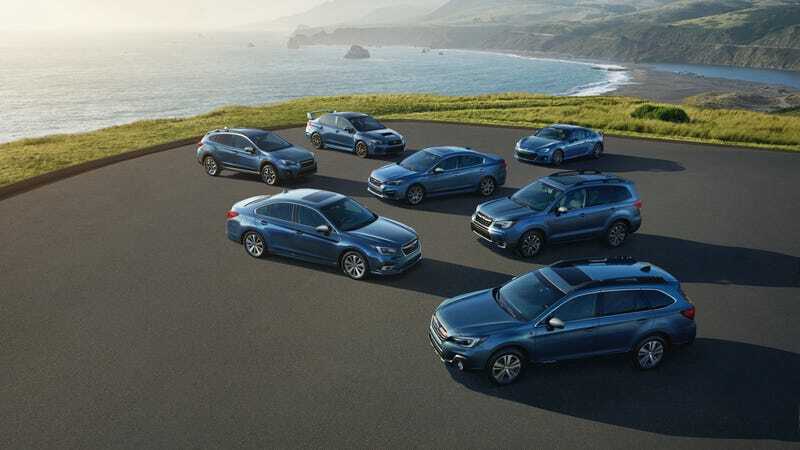 Subaru has been around in the United States for 50 years and they’re celebrating with a very limited anniversary trim on their lineup. But who cares about some trim? Not you! What’s more interesting is the story of Subaru. Everyone knows about the Outback and the WRX STI. But it has quite a storied history of models and have actually produced some weird cars in years past. In 1968, Malcolm Bricklin (yes, that Bricklin) and Harvey Lamm cut a deal with Subaru to become Subaru of America and the sole marketer and dealership network for Subarus in the United States. Before Subaru became the ubiquitous all-wheel drive cars we see everyday, it started with the humble 1968 Subaru 360. The 360 was a little egg powered by a two-stroke with suicide doors. What’s not to love? In 1970 Subaru unveiled the first generation of its iconic boxer engine with the Subaru FF1. This one wasn’t equipped with all wheel drive but it was almost the Subaru we know today. The FF1 would make a great candidate for an STI engine swap is all that I’m saying. The first Subaru with any kind of four wheel drive system was the Subaru DL/GL in 1975. This model of Subaru lasted more than 25 seconds unlike the previous Subarus. According to Subaru’s website, the GL was “The official car of the US Ski Team” for almost 20 years. I don’t know what that has to do with a station wagon but it’s getting closer to the contemporary brand of Subaru. Subaru was not exempt from the mini truck craze of the 1970s and 1980s. The BRAT was unveiled in 1978 and Ronald Reagan bought one. Normally that would be a death sentence to the cool factor of any vehicle but the BRAT lives on and is remembered today as being weird as hell with the backwards facing seats in the bed. No one was exempt from the wedge shaped car trend of the 1980s and Subaru was no exemption. The XT was Subaru’s entry to the angular game and in my opinion, the world was not ready. It was a vector graphics space ship with some Subaru DNA that was too perfect for this world. Did you know that Subaru made a sports car? Neither did Subaru! The SVX was an Italian designed coupe with goofy mini window within a window things. It was apparently made from 1992-1997. I’ve never seen an SVX in the wild and now it’s all I can think about. Subaru has a bit to celebrate. While I wish they would bring back the XT or SVX for their half a century of selling cars in the States. I guess some nice blue trim levels are fine too.